Britain has always been at the forefront of filmmaking in the world perhaps second only to the US in its range, quantity and scope of films produced. With stars like Lawrence Olivier, Charlie Chaplin (yes, he was born in London), Alec Guinness, Michael Caine, Peter Sellers and Ewan McGregor amongst many others, and directors of the calibre of Alexander McKendrik, Derek Jarman, Alfred Hitchcock (yes, also born in London), the Boulting Brothers, to name just some, Britain is justifiably proud of its home-grown talent. 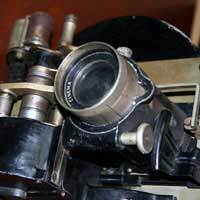 The French Lumière brothers are credited with inventing cinema in 1892, by projecting a lantern through celluloid movie reels. They brought their touring show to London in 1896. The first actual British film is said to be 'Incident at Clovelly Cottage' made in 1896 by Robert Paul and Birt Acres, who built and ran their own movie camera. From then on, the film Industry was born in Britain, with help from American financiers, eager to capitalise on British industry, design and ingenuity. In 1914, during the First World War, 25% of the films shown in Britain were British. This was partly due to an increase in war reporting and footage from the war. Alfred Hitchcock's 'Blackmail' in 1929 is credited with being Britain's first talking picture.From this point on, between the wars, British film grew and developed it's range. The advent of social documentaries came with the work of John Grierson, and then Humphrey Jennings amongst others, studios were created (often supported by American financing), and stars were born. The classical stage actor, Lawrence Olivier made his wonderful 'Henry V' in 1944 as his contribution to raising the morale of Britain. Using Shakespeare's highly moral writing of the character of the British King, with his address to his troops on the eve of Agincourt, Olivier boosted both the country and the film industry with this epic, filmed in Technicolor. He then followed this up with his unique cinematic version of 'Hamlet' in 1948. This is a dark, heavily shortened version of the play, filmed in black and white. It is full of Olivier's legendary stagecraft – death-defying jumps and falls. A great visual treat and legacy of a brilliant actor-director. After Britain recovered from the war effort, the film Industry sparked into overdrive, with a series of successful themed movies: the Ealing Comedies, the Doctor films (introducing the young star Dirk Bogarde), the St. Trinian films, and then the hugely successful 'Carry On' films, starring Sid James, Kenneth Williams, and Frankie Howard. The Hammer studios started producing its popular 'Hammer Horror' series at the end of the 50's, using readily available locations and cheap effects. The 1960's saw a huge boom in British film: the 'Kitchen Sink' realism promoted through such classics such as John Osbourne's 'Look Back in Anger' (1958), directors such as Tony Richardson forming Woodfall Films in partnership with the playwright Osbourne; other radicals such as Lindsay Anderson, and then the birth of James Bond in 1962 with 'Dr. No'. While British cinema and the British film industry in general has seen slumps as well as booms over the past 25 years, it has produced extraordinary films – films to make audiences laugh, cry, think, scream, and above all; come out of a cinema happy they spent time and money at the movies. British audiences know they will get a great hour or two's entertainment when they watch a British film, be it a black and white classic from the forties or fifties, or a newly released romp, like the wonderful 'Hot Fuzz' (2007): a funny horror police yarn, written by and starring Simon Pegg.